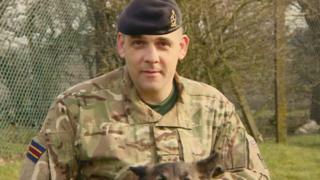 A British war veteran being held in a Dubai jail over drugs claims has said he "just wants to go home". Andy Neal, 44, said he has been in prison without charge since October despite the allegations being dropped. Campaign group, Detained in Dubai, who has taken on his case, said he is the victim of "shameful police misconduct". Speaking from prison, Mr Neal asked the UK government to intervene and get him "back to loved ones as soon as possible". In the audio released by the campaign group, Mr Neal said: "I would've thought the Dubai prosecutors would have released me after all allegations of being involved in this case were removed and statements to that effect were signed." He said he had a meeting to discuss being released on Thursday, and added: "I have been told that before but decisions have not happened." Andy Neal served in the Army for 24 years as a corporal and a dog handler, with tours in Iraq, Afghanistan, Bosnia and Ireland. Image caption Mrs Neal said the first time she saw her husband in jail, he broke down in tears and said "I had nothing to do with any of this"
His parents, from Arnold, Nottinghamshire, said their son had been forced to sell his two businesses and family cars since he was jailed and they wanted him returned to the UK. Dad, Maurice Neal, said: "We fear now more for Andrew's safety now than we ever did when he was in a war zone. "There's no way he would be involved in anything like that. It is not his country and he would avoid it at all costs. Mr Neal's parents said the Foreign Office had been unhelpful and a "waste of time". Mum, Sue Neal, said: "Nobody's made a comment to say they know about it and are now taking action. "We're left in the dark. We're very disappointed." Detained in Dubai said during Mr Neal's arrest at his home, police punched him twice in the stomach and accused him of handling drugs, which he denies. At the station, they said officers drew up a statement in Arabic and "forced" Mr Neal to sign it using his fingerprint. It was later found to be a confession, they added. A Foreign and Commonwealth Office spokeswoman said they are providing assistance to a British man after his arrest in Dubai and his family.